The daughter expressed her fervent wish that the groundhog would not see his shadow today. That’s right, isn’t it. No shadow. Hello Spring. Shadow. Down the groundhog hole for a snuggle in as the Old Man rages on. I can never keep it straight. Technically, it amounts to about the same length of time, so the fuss eludes me, but if a shadow free peek see brings this miserable winter to a swift end – I am in favor. Our second thaw commenced overnight as the temps began climbing back to freezing. The last thaw turned the January snowstorms to mush which froze solid when the arctic blast regained its supremacy, creating jagged grooves and ruts on the unplowed streets that even my truck dislikes negotiating. This new thaw might give the plows an opportunity to complete their shearing of the remaining roads and haul away the few mountains left at the side of streets and in the parking lots. Normally, it’s the continuing snowfall in April that gets me, but this year, winter overkill has come early. Life though has taken on a Groundhog’s Day– like aura in a Bill Murray sort of way. Okay, not that sinister, but my weeks are interchangeable. And Rob feels it too. And a holiday? Not on the horizon. Though I watch with a mixture of envy as those I know fly off and return from warmer climates, I am not sure that an “away” vacation is what I need. A break from routine, certainly. Lazy days where nothing is scheduled and the clock can be blissfully ignored for a while could do, I feel, wonders. I’ll keep you posted, but in the meantime, enjoy the day whether Phil sees his shadow or not. Winter stays until he tires or Spring bulks up enough to kick him along his way. It’s out of our hands, regardless. Word here stateside is that the groundhog didn’t see his shadow. Okay…does that mean that the latest foot of snow will melt any faster? 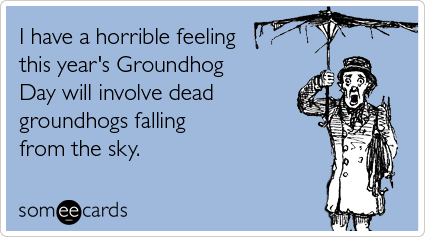 Alas, the groundhog is not relevant.